Pollution is bad, right? To some animals, it's home. Thousands of shipping containers are lost from cargo vessels each year and many of them sink, never to be found again. In February 2004, the cargo vessel Med Taipei was traveling southward along the California coast when severe winds and seas dislodged 24 shipping containers, 15 of which were lost within the boundaries of the Monterey Bay National Marine Sanctuary. Four months later, during a routine research dive using the remotely operated vehicle (ROV) Ventana, MBARI scientists discovered one of these containers on the seafloor 4,200 feet below the surface. In March 2011, a research team led by Andrew DeVogelaere of the sanctuary and Jim Barry of MBARI completed another ROV dive at the container. During this dive, they collected extensive video footage, as well as samples of seafloor sediment at various distances from the container. They then compared the animals found on the container, on the nearby seafloor, and on the surrounding seafloor out to 500 meters (a third of a mile) away from the container. Josi Taylor, the lead author of the recent article, said that she was surprised to see how little the container had corroded in the seven years since it sank to the seafloor. Apparently, the near-freezing water and low oxygen concentrations in the deep sea slowed the processes that might degrade sunken containers in shallower water. As expected, the hard surface of the container acted somewhat like a rocky reef, attracting animals such as tubeworms, scallops, snails, and tunicates. Such animals require hard surfaces on which to attach, and were not found on the muddy seafloor around the container. Surprisingly, several types of animals found on nearby rocky reefs, such as sponges, soft corals, and crinoids (a distant relative of sea stars), had not colonized the surface of the container. The researchers speculate that some of these slow-growing animals might not have had enough time to colonize the container's surface. Another possible explanation is that some types of animals may be sensitive to the potentially toxic effects of corrosion-resistant coatings used on shipping containers. The team conducted a follow-up ROV dive in December 2013 to study possible effects of the container's coating. The samples from this dive are still being analyzed. The researchers also discovered differences in the types of animals living on the muddy seafloor within about 10 meters (32 feet) of the container. Within this zone, deep-sea snails in the genus Neptunea and some types of crabs and fish, including deep-sea rockfish, were more abundant than in surrounding areas, while sea pens and other filter feeders were less abundant. Overall, the researchers suggest that the container caused shifts in animal communities through a variety of processes. Its physical presence provided: 1) a hard surface that sessile (attached) animals colonized; 2) a physical obstacle that affected local bottom currents, 3) a high spot on the seafloor that attracted predators, and 4) a possible source of toxic materials. The researchers also believe the container is having indirect ecological impacts, some of which may take years or decades to develop. For example, higher numbers of seafloor predators near the container might explain some of the changes in the types of other animals found on the nearby seafloor. Such indirect ecological effects might also explain why the diversity of seafloor animals was lower near the container. This collaborative research project has already helped government agencies in formulating standards for how containers are weighed, stacked, and lashed down. It has also spurred interest from both governmental agencies and the shipping industry in finding a way to track the number of containers lost at sea each year. DeVogelaere noted, "The fact that our research was mentioned by the U.S. Coast Guard in the background material for a proposed lashing rule shows that this work has clear societal value." During future dives to the container, the researchers hope to find out whether more diverse animal communities will develop over time, or if some toxic material is allowing only certain hardy animals to colonize the container. They are also designing a study to compare the effects of different types of container coatings on colonization by deep-sea animals. This particular container held a shipment of car tires. Other containers are used to transport more acutely toxic materials, such as batteries, pesticides, and raw chemicals. These substances would only add to the possible effects of a sunken container. 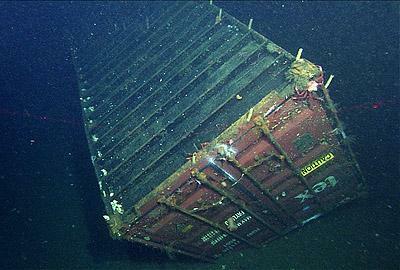 Given the slow rate at which the sunken container is corroding, and evidence from deep-sea shipwrecks such as the Titanic, the researchers hypothesize that lost containers may take hundreds of years to fully degrade in the deep sea. This suggests that each year thousands of shipping containers are accumulating on the deep seafloor, especially along busy shipping routes. Taylor said, "We have only begun to characterize the potential long-term impacts of a single container on a deep-sea community. Although the effects of one container may seem small, the thousands of shipping containers lost on the seafloor each year could eventually become a significant source of pollution for deep-sea ecosystems."